After more than seven years together, Gretchen knew that if she wanted to surprise Megan with a ring, she’d have to carefully plan out every detail. These two do everything together — they even founded a flourishing business, Sand Spa, together when they were in their early 20s — so, like Gretchen says in their proposal video, even slipping away to get the ring designed was a challenge. 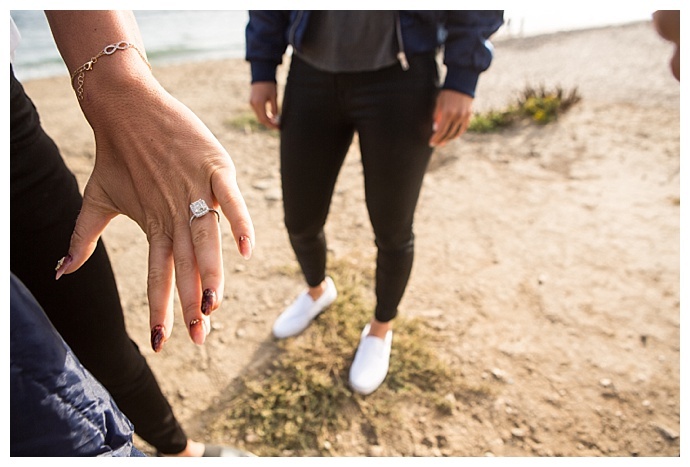 But with a rock solid plan in place that included a fake photo shoot and custom bomber jackets to pop the question, she ended up completely shocking her bride-to-be, which Nicol Biesek Photography captured beautifully on camera, and Megan finally got to say yes! Seven years later, Gretchen couldn’t wait any longer to ask Megan to be her wife. She’d had a ring for the past year, but after everything they’d been through, she wanted to redesign it before giving it to Megan. “I redesigned it because I felt like I wanted to put new energy into the entire proposal,” Gretchen says. “I had the other ring for over a year, and over the course of that year, we opened a new business, expanded into a few hotels and this was something I definitely didn’t want to rush.” With the ring ready, Gretchen began to put her plan in place. 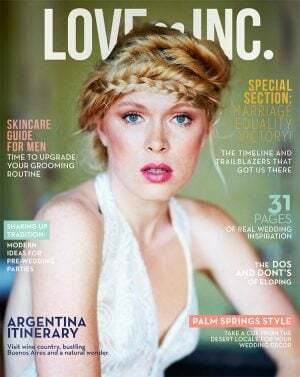 “I got this email about being featured in a magazine and how they wanted to do a photo shoot and if we could use one of our photographers,” Megan says. “I immediately thought of our very talented friend Nicol and was super hyped on this.” Little did she know, that was all part of the plan. 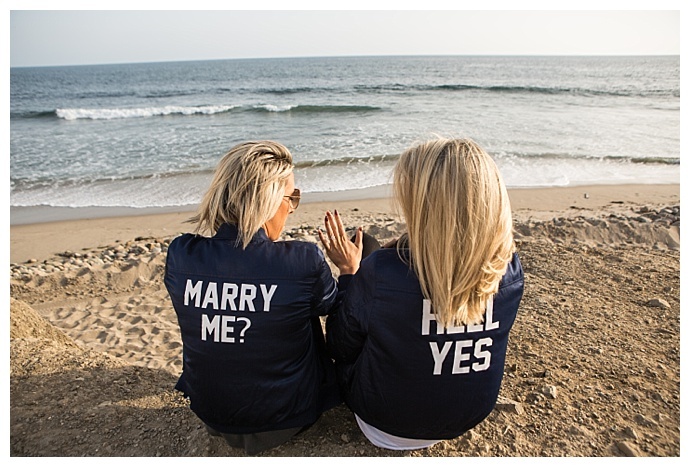 It was then that Gretchen got down on one knee, with her back facing Megan, the question “Marry Me?” visible on the jacket. “Finally, Nicol tells me to turn toward Gretchen, and just like that, my whole world changed,” Megan says. “It was a dream, the most epic surprise ever!” After the ring was on Megan’s finger and reality had set in, the fake photo shoot wrapped up and the newly engaged girls headed to Rosenthal Winery across the street where Gretchen had arranged for all their friends and family to be there to celebrate their big news!